At first glance, Microsoft (MSFT - Get Report) does not scream out as a bargain opportunity. But once we dig a little deeper, it's apparent that Microsoft is indeed a terrific investment for both enterprising and risk-averse investors. If the game on Wall Street is to keep compounding returns above the S&P500 (SPY - Get Report) over time, then there are only a few stocks which are likely to help investors accomplish this goal. Notwithstanding its size, Microsoft still succeeds in aggressively growing both its top-line and bottom-line. And what's more is that the growth Microsoft generates is fairly well diversified amongst its three reporting segments. The table below shows revenue growth in constant currency. What the table above subtly demonstrates is how consistently each segment continues to perform. Why is this important? Because steady predictability over time gets rewarded strongly in the stock market. If we step back and think through the overarching criterion of a pension fund manager, they seek to deploy capital where it can steadily and without surprises compound over time, and Microsoft delivers that in spades. The awesome trait of Microsoft which often times goes unappreciated is just how asset-light its business model is. Wall Street obsesses over earnings but spends little time considering the fact that a large portion of most businesses' earnings needs to be deployed back into their respective businesses as capex, to ensure the business has enough capital to grow adequately. That is not the case with Microsoft. For instance, Microsoft's Q2 2019 generated $8.6 billion of non-GAAP net earnings, while its free cash flow reached $5.2 billion, or more than 60% of its earnings ended up as tangible free cash flow. Furthermore, in Q2 2019, the commercial revenue annuity mix was approximately 90%. That makes sense, since Microsoft's packages have been the foundation on which the modern workforce has been built on. Companies don't want to spend unnecessary time solving IT issues. They want an IT package which works all the time, securely and from anywhere. Microsoft is the epitome of reliability. And companies globally are more than satisfied to pay up for peace of mind. In other words, Microsoft is able to have a very strong recurring revenue stream without needing to be capital intensive to secure its competitive advantage. Microsoft's balance sheet finished Q2 2019 with more than $54 billion in net cash. Given that Microsoft is extremely free cash flow generative, and that it doesn't need much capital to continue to grow, this allows Microsoft to have one of the best capital return programs. More specifically, Q2 2019 saw Microsoft return to shareholders $9.6 billion via dividends and share repurchases. To put this bold capital return into perspective, the last six months have seen Microsoft return to shareholders roughly 75% of the total return Microsoft made to shareholders during its FY 2018. At first glance, the table above does not scream of a bargain opportunity. However, a little context is important. Most of the peers above have strong concentration risk with just one product or service. For example, Apple's (AAPL - Get Report) profit is heavily dependent on the success of the iPhone, while Alphabet (GOOGL - Get Report) (GOOG - Get Report) is hugely dependent on its advertising revenue. Amazon's (AMZN - Get Report) revenue base is the most diversified, but it is also the least profitable of all large tech companies. Therefore, I contend that Microsoft is the best all-around investment, given that it has high quality, well diversified, predictable growth and is certainly not overpriced. Microsoft, Apple, Alphabet and Amazon are holdings in Jim Cramer's Action Alerts PLUS Charitable Trust Portfolio. Want to be alerted before Cramer buys or sells MSFT, AAPL, GOOGL or AMZN? Learn more now. 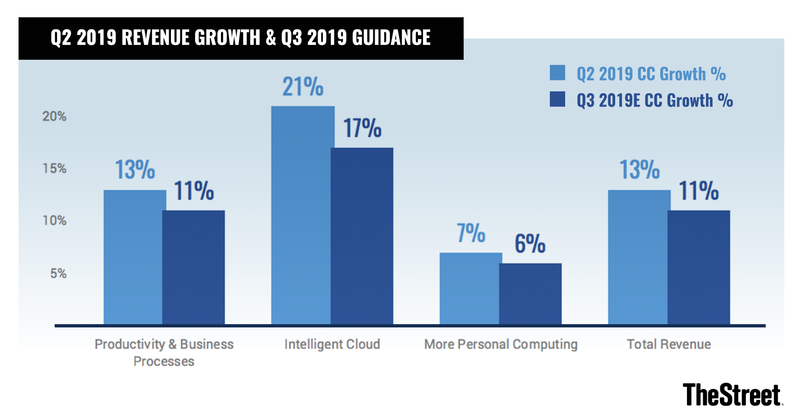 Microsoft continues to deliver steady growth, yet investors do not appear to be fully convinced of its medium-term prospects. However, the fickle market will in time again recognize that asset-light, free cash flow generating companies that are not overvalued are few and far between. Microsoft is one of these companies. And best of all, it is wisely returning large amounts of capital to its shareholders.